Everything Rachael Ray: Express Lane Meals Releases Today! Express Lane Meals Releases Today! 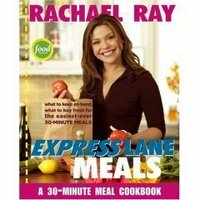 So today is the big day that Rachael Ray's newest cookbook, Express Lane Meals, is released. I pre-ordered mine from Overstock.com and they say they shipped it yesterday and it should get here by Friday. I am not sure if I can wait that long to check it out (I know I am a loser) so I might have to visit a nearby bookstore at lunch to see if they have it on display. 365 No Repeats is still on the NY Times Bestseller List, so it will be interesting to see if RR has two on that list at once with the release of Express Lane Meals. Take the "fast lane" to delicious meals you can whip up on your busiest nights! In Express Lane Meals, Rachael shows you how to stock your cupboard, fridge and freezer so you're always 30 minutes from a mouth-watering meal. Within this clever, time-saving cookbook's three categories-"Meals for the Exhausted," "Meals for the Not Too Tired" and "Bring It On! (But, Be Gentle)"-you'll find 101 of Rachael's quickest and easiest recipes. Like an easy-to-follow roadmap to great meals, Express Lane Meals includes a helpful list of nearly 70 kitchen staples, plus Rachael's Top Five Tips to get you grocery shopping like a pro! Better yet, every recipe uses 10 ingredients or less! From Tex-Mex and Mediterranean to Italian and Asian, you'll learn what to keep on hand and what to buy fresh for your favorite foods. With the right mix of the simplest ingredients you can enjoy a wholesome, "de-lish" meal that's ready in a flash! Expect a general review after I finally receive it!